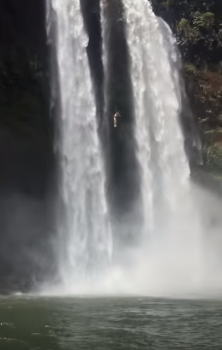 A dim-witted daredevil instantly regretted his decision to jump from the top of a 173 foot waterfall in Hawaii. 21-year-old Shiloh Shahan travelled to the top of Kauai’s Wailua Falls with his friend before deciding to make the jump. He quickly regretted his decision as he passed out at the bottom, relying on two brave tourists to swim out and rescue him, Mashable reports. The spontaneous lad from California, had quite a ‘deep’ reason for jumping. It was at a really pivotal point in my life. Everything was changing, and it felt like the right thing to do. David McGrath, who was at the bottom of the waterfall, filmed the jump from a different angle before he and his daughter rescued unconscious Shiloh. According to the Tribune, Shiloh suffered a concussion as well as torn muscles in his back and chest. The police officers and paramedics who arrived at the scene questioned Shiloh as to whether his jump was a suicide attempt. I told them, ‘no, it was a calling’. The metaphysical maverick refused medical treatment and walked away from the scene on his own…drop the mic.